Reading this email from Beth just tore me apart. My heart hurt for her to feel that finality in her life. At the same time, I was impressed by Beth’s inner strength. Instead of wallowing in her sadness, Beth harnessed all those emotions and created this amazing blog about our plastic consumption. I encourage everyone to read this site. It has really opened my eyes as to our plastic consumption and its effects on our environment. Since reading Fake Plastic Fish’s posts, I have tried to make an effort to not buy plastic that I intend on throwing out. Many plastics you can not recycle in certain areas; so where do they end up? They end up in our landfills or worse yet, litter our world. Plastic bags have received a lot of negative publicity lately. 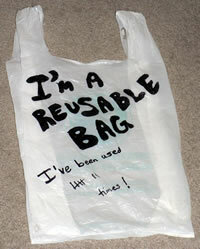 Read Beth’s post on “Be Careful on the Reusable Bags Bandwagon.” You can find comments about this post on her website. Happy reading. But if you’re really jonesing for a brand new bag, the site Reusablebags.com carries quite a few of these options, including bags made from recycled plastic as well as renewable natural fibers like hemp and cotton. However, I recommend this site with some reservations. In addition to bags made from recycled plastic and renewable materials, Reusablebags.com also carries quite a few bags made from new petroleum-based synthetics, including the Reisenthel nylon bags mentioned above. The goal of Reusablebags.com is to reduce the amount of disposable plastic entering the waste stream each day from single-use bags. And all of the bags that they sell will help meet this goal. But I don’t think the folks at Reusablebags.com are looking at the bigger picture. All of the bags that they sell have a life-span, whether that life-span is 1 day or a few years. Eventually, they will all wear out. And when that happens, what will happen to the materials of which they are made? The fabric from cotton and hemp bags will certainly biodegrade. But it could take many human lifetimes for the synthetic bags to break down, if they ever do. There is currently no organism that can break them down. When I wrote to Reusablebags.com questioning their inclusion of certain products on their site, the response was, “When choosing products for our website, there is always a balance between the positives and negatives of a product in our choice to showcase them.” It’s my opinion that they allow too many of the negatives to slip past the judges. 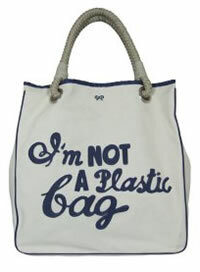 Still, as I said, the site is very useful for finding reusable shopping bags that are made from sustainable materials. You just have to read the descriptions carefully before deciding what to purchase. Finally, whether we decide to carry our groceries in reused plastic bags, new bags from renewable sources, or homemade bags, the main point of this article is that we all need to stay awake and aware. It’s easy to be swayed by “green” marketing language that is really just a masked come-on for mindless consumption. It’s not so easy to see past the advertising to the reality that the best way to step lightly on the earth is to stick to the 3 R’s: Reduce, Reuse, Recycle, in that order. Nowhere in that list is Buy More Crap. Plastic is evil for the environment. I do think that reusable bags are a visible way that people can show solidarity for the planet.